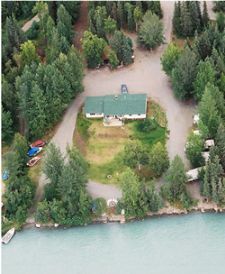 Many local lakes on the Kenai Peninsula are stocked with landlocked Silver Salmon and Rainbow Trout and are accessible off the road system or a short hike. A great way to spend a day with the kids, teaching them to fish and enjoy the outdoors, Peninsula lakes are also home to some large native Rainbow Trout, Lake Trout, Grayling, and Dolly Varden. The Swanson River Canoe Trail System of Lakes & Streams is Alaska's version of the Boundary Waters Canoe System on the Minnesota/Canadian border. Local outfitters provide canoes and kayaks for access to the remote waterways that make up this canoe system, and fishing for Rainbow Trout and Dolly Varden can be outstanding. The lakes are too numerous to list here, but here's a great resource site for more information, or contact Kenai Riverfront to help plan a trip this year (great for ice fishing too)!